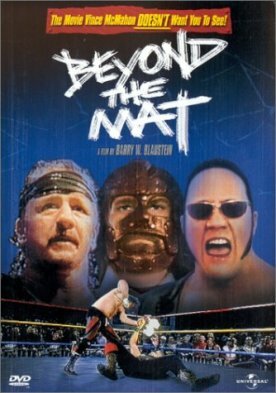 Professional wrestling is truly postmodernism in sport, which makes it surprising to me that there have not been more documentaries like Beyond the Mat, directed by Barry Blaustein. This movie, though it is rather badly organized and tries to do too much, contains some marvelous, even unforgettable footage of what life is like behind the scenes of the World Wrestling Federation. In the end, I think, Mr. Blaustein is a little too close to his subjects. Right at the beginning he tells us that he has been a huge fan of the sport since he was eight years old, and we see an amusing vignette in which a middle-aged man, presumably standing in for Mr. Blaustein's old-fashioned, buttoned-up father, says with a shake of the head: “Can you imagine the level of the mind that watches wrestling?” But it seems that he is still just a bit too much of a fan to see his featured wrestlers—Terry Funk, Mick (“Mankind”) Foley and Jake (“The Snake”) Roberts—without the filter of hero-worship. “How did you want it to turn out?” she says. Quite what Jake's family problems are supposed to have to do with wrestling is never clear, and the time Blaustein spends on them strikes us as being rather a manipulative device up until this point. But “we've never had a Walt Disney ending” has something of a ring to it. It is as true of the lurid melodrama of the WWF as it is of a great many other things in our degenerate culture—including even Walt Disney endings, I would argue. Perhaps “the level of the mind that watches wrestling” cannot rise to them.